The broadcast networks’ most anticipated new fall drama series finds the nation’s capitol split in two after a devastating attack of unknown origin. Donald Trump can’t wait to tweet about how “soft” we’ve become while Kiefer Sutherland doesn’t at all mind gearing up to save the world again. The series is Designated Survivor, which looks like a badly needed hit for ABC unless viewers unaccountably have grown weary of their national institutions being blown up for dramatic purposes. 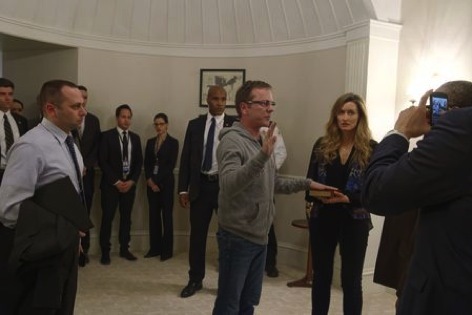 Wednesday’s opening episode, the only one made available for review, solidly sets the hook while only partly weaning Sutherland from all those years as Jack Bauer on 24 (which Fox plans to reboot without the Jack Bauer character following the Feb. 5th Super Bowl). Sutherland plays the initially bespectacled Tom Kirkman, a policy wonk who’s about to be jettisoned as secretary of housing and urban development by the President who appointed him. Crestfallen Tom is wearily reconciled to taking a throwaway ambassador position while his attorney wife Alex (Natascha McElhone) balks at uprooting their family again and taking her away from a job she loves. Sutherland at times succumbs to his breathless Jack whisper/rasp. But he’s otherwise fairly convincing in the role of a married dad with two demanding kids whose previous idea of action was a subsidized, affordable apartment complex in a low-income neighborhood. Now he’s beset by a prototypically bellicose, war-thirsty, scheming general and doubters all around. The guy can’t even vomit in a toilet without hearing someone in the next stall diss him as an ineffectual underling who will never cut it. This turns out to be the newly deceased President’s speechwriter, Seth Wright (Kal Penn). “Well, maybe I’ll surprise you,” Tom tells the surprised Seth, who’s then ordered to write him a national address of import and resolve. The two kids are little Penny “Peanut” Kirkman (McKenna Grace), who’s already adept at manipulating daddy, and problematic teen son Leo (Tanner Buchanan). He appears to be doing some something illicit at a club before the FBI tracks him down. Maggie Q joins in as FBI agent Hannah Welles, who quickly asserts herself and plunges into an investigation of the attack. And Italia Ricci plays Emily Rhodes, formerly secretary Tom’s dedicated chief of staff. The accidental president girds himself by the minute while being introduced to the “nuclear football” in a full-blown “DefCon Two” crisis. Iran is quickly fingered as an unprincipled enemy seeking to capitalize on this cataclysmic situation. But Tom’s cooler, calmer head begins to take hold, even as he tells his wife, “I’m not the guy for this.” Hang in there, though, because Jack Bauer has encountered far worse and duplicitous Presidents season-to-season on 24. Now it’s up to the scriptwriters to convincingly “grow” Tom into the job while testing both his principles and his ability to navigate the wicked Washington, D.C. thicket. Fighting global terrorism is only part of the job. And given our ongoing toxic political climate, it sometimes almost seems like the easier part.